Makayla Cooper drives into the paint as Molly Lane defends. Jenna Hoschouer drives the baseline against Sid Rigsby. Shalaya Heath fights inside to score during the second quarter. 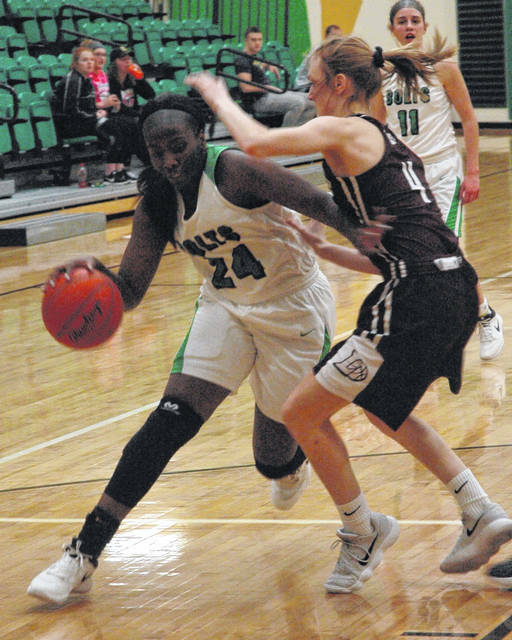 CLAYTON — In the third game of the season the Northmont girls basketball team lost to Lebanon by a basket, 48-46. 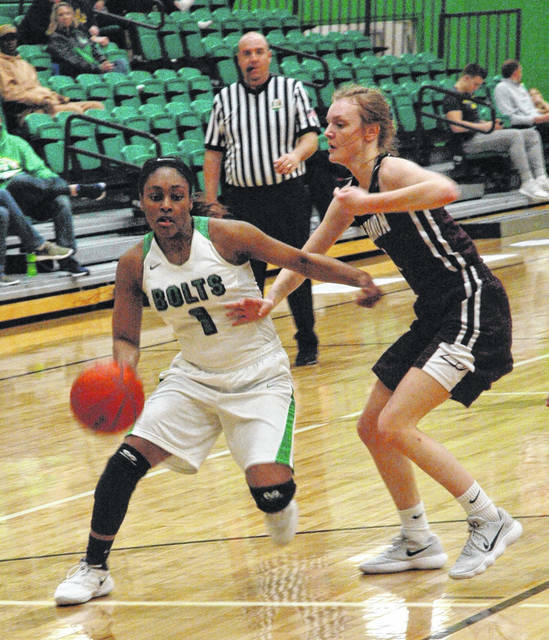 Wednesday night the Lady Bolts came up short again against Lebanon, 52-48. 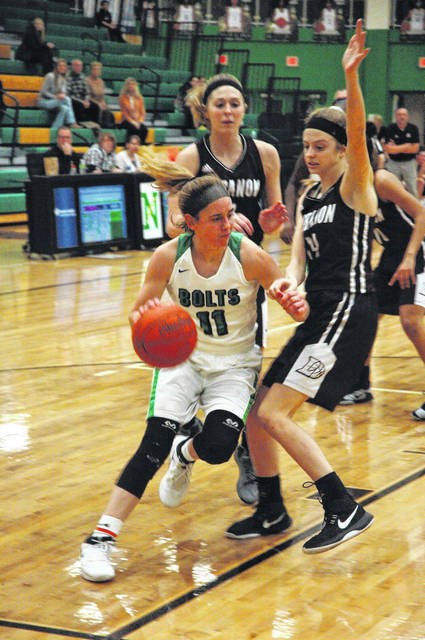 Northmont had its chances late, but a couple of missed shots and two turnovers proved costly. With the score deadlocked at 44-44 Salena Roberts came up with a steal and after the Lady Bolts moved the ball in for a potential shot, they turned the ball over. Lebanon couldn’t capitalize on the turnover and on their next possession Northmont committed an offensive foul. On the change of possession Eva White snared an offensive rebound and scored to put the Lady Warriors up 46-44 with 4:25 remaining. Northmont committed a turnover on its next possession and Sid Rigsby drew a foul from Makayla Cooper and converted one of two from the charity stripe. Kendall Folley (17 points) scored an uncontested layup to boost Lebanon’s lead to five with two minutes to play. Folley scored a free throw and another layup to put Lebanon up 52-45 with half a minute remaining to effectively seal the victory. Shalaya Heath led Northmont with 16 points but was held to four points in the second half. She also snared 12 rebounds. Other than Heath, the rest of the lineup was inconsistent and played with a certain degree of hesitancy under pressure by Lebanon’s defense. Neither team shot well from the free throw line. Northmont went 9-20, Lebanon 8-22. “We didn’t shoot very well from the free throw line but I felt like we showed up and played tonight more than we have the last couple of games against good teams. It was a good boost to get us ready for the tournament,” said Northmont Coach Bethany Kincer. The tournament draw takes place on Sunday. The Lady Bolts will host Springboro (16-3) on Saturday at 1 p.m. and non-conference opponent Eaton on Monday at 7:30 p.m.
Lebanon: Alexis Straw 4-1-10, Audrey Magness 0-1-1, Sydney Hanna 3-0-6, Eva White 4-0-8, Sid Rigsby 0-2-2, Kendall Folley 7-1-17, Ashley Popp 2-3-8. Totals: 20-8-52. Northmont: Makayla Cooper 2-3-8, Jenna Hoschouer 2-0-4, Anna Mangen 2-0-6, Salena Roberts 1-2-4, Camryn Nadir 2-2-6, Shalaya Heath 7-2-16, D.J. Shepherd 1-0-2, Gabby Kline 1-0-2. Totals: 18-9-48. 3-point goals: Lebanon 4 (Folley 2, Straw, Popp); Northmont 3 (Mangen 2, Cooper). Records: Lebanon 16-3 (6-3), Northmont 9-8 (2-7). JV Score: Northmont54 Lebanon 36.